Part memoir, part history, part travelogue- the book is well written and well paced, and the story seems too good to be true- except it is! Allow yourself to be swept away by the author’s contagious (and justified) excitement over the return of Uncle Matty’s rifle. A wonderfully personal account of a rich piece of American history; this story combines the life of a young Irish American kid in the Bronx with the harsh realities of a nation at war. A true delight to read; one gets a sense of the culture and style of the Bronx both during and post WWII; it is a reflection of a man who has embarked on a mission to understand more about his family, and his Uncle Matty, and through the process, discovered much about himself. Definitely worth the read, so many entertaining stories!! A fascinating personal journey from the rough streets of the south Bronx to the historic Normandy. a lot of interesting characters and stories along the way that will touch and move you in a patriotic and heartfelt way. the book flows easily with a few twists and turns and a surprise or two. highly recommend. 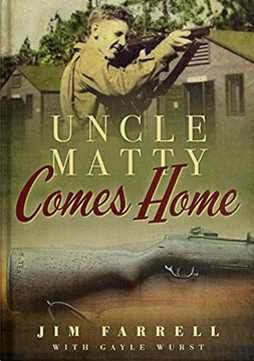 Uncle Matty Comes Home is a terrific read and will hopefully be adapted into a movie format. Want to know more about Uncle Matty? Don't hesitate to contact Jim today! Copyright © 2017 Single Throw Digital Marketing. All Rights Reserved.